Like most Output products, ARCADE makes use of 4 Macro controls on the Play Mode that are used to control multiple parameters at once. Assigning parameters to Macros are similar to assigning Modulation. Simply right-click on a parameter’s knob or slider and select Assign Macro. Then choose from Macro 1 through 4 to assign the parameter. Next, dial in the minimum/maximum range that the Macro will ‘turn the knob’ in a either to the left or right. To do this, click and drag on the knob/slider up or down. As you drag, you’ll see a white fill line indicate where the knob will end up when the macro control is set to it’s full value. Once the range is set, click anywhere outside the knob to set the Macro assignment. You can use a Macro slider to increase or decrease the strength of modulation happening on a knob. We refer to this technique as Macro Assigning Modulation Amount. To do this, you first have to have modulation assigned to a parameter. Then, right-click again and select “Assign Macro to Modulation” and select which Macro you want to use. 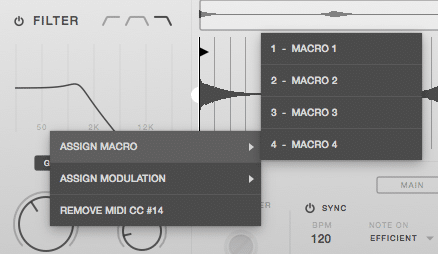 Next, you’ll set the Macro range on the Modulation Amount by click + dragging up or down. Dragging up from center will result in more ‘right to left’ (i.e. positive polarity) modulation as the Macro slider advances from a low to high value. The opposite is true for dragging the Macro range down from center – it will result in more ‘left to right’ (negative polarity) modulation as the macro slider advances from low to high. Using the Macro range will adequate adjust the modulation amount when the Macro slider is at its maximum point, but if you want to edit the modulation amount corresponding to a minimum Macro value, you can edit the modulation amount on the parameter on the knob directly via the right click menu or open the Modulation Overview page and adjust the Modulation Amount slider. Now that you have the Modulation Amount and Macro range connected to Modulation Amount is set, you can use the Macro Amount Slider on the main page to dial in Modulation Amount. Congratulations, you’ve now earned power user status.